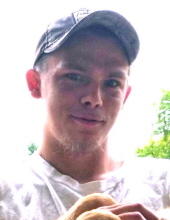 Celebrating the life of Robert Kyle Ahalt Jr.
Obituary for Robert Kyle Ahalt Jr.
Robert Kyle Ahalt Jr (Robby), 24, of Frederick, MD unexpectedly passed on from this life on Oct.12th 2018 in Baltimore, MD. Robby was born on Oct. 2nd, 1994. Robby left behind his two children, Colton 4, and Kayleigh 2, along with his girlfriend Allyson Blanken of Frederick, MD. Robby is survived by his parents Serena Rippeon and Garry Ketterman Jr of Bolivar, WV, biological father Robert Kyle Ahalt Sr and wife Nancy of Cumberland, MD, siblings, one sister Nicole Dorsey "Nikki" of Charlestown, WV, 3 brothers, Christopher, Joshua and Cody Ketterman of Frederick, MD, maternal grandparents Wayne and Glenda Rippeon of Frederick, MD, paternal grandparents Jimmy and Terry Miller of Thurmont, MD, along with his great-grandmother Dottie Ahalt "GaGa" of Frederick, MD and he will be greatly missed by many Aunts, Uncles, Cousins, Nieces, Nephews. Robby was preceded in death by his paternal grandfather Norman Ahalt Jr and his paternal great grandfather Norman Ahalt Sr, along with his uncle Harry Leo Stoner ll "Bub", maternal great grandparents and his great aunt. Robby enjoyed spending time with his family especially his children. He loved outdoor activities such as dirt bike riding, fishing, camping and taking his kids on hikes to the river. He also enjoyed listening to music and going to concerts. Robby was an amazing father, his kids brought out the best in him. He will truly be missed by all who knew him. Services will be held at Hartzler Funeral Home-Libertytown @ 11802 Liberty Rd. Frederick, MD 21701. Viewing for family and friends will be held on Wednesday Oct.17th, 2018 from 2pm-4pm and 6pm-8pm. Funeral is Thursday Oct.18th, 2018 @ 11am. To send flowers or a remembrance gift to the family of Robert Kyle Ahalt Jr., please visit our Tribute Store. "Email Address" would like to share the life celebration of Robert Kyle Ahalt Jr.. Click on the "link" to go to share a favorite memory or leave a condolence message for the family.